You’ll be better equipped to handle whatever your day throws at you when you start each morning with 10 minutes of “soft belly” breathing, says Susan Blum, M.D. in The Immune System Recovery Plan. This is a relaxation exercise that works in several ways. 1. It helps expand the base of your lungs, which helps bring extra oxygen to your brain. This lowers anxiety and induces greater relaxation. 2. The words “soft belly” create an image of a soft belly in your mind, which increases the effectiveness of the relaxation response. 3. The exercise is a simple relaxation technique that turns off the sympathetic nervous system and turns on the parasympathetic nervous system, lowering the blood pressure, slowing the heart rate, enabling deeper breathing, and inducing a state of calmness. 4. Focusing on your soft belly will give your mind a rest from the constant chatter and thinking. This will help you feel more relaxed and also help you focus and concentrate better during the day. You can read these instructions first, and then close your eyes and begin. Or you can record the instructions on your phone or computer and play them back to guide you the first few times you do it. • Sit up in a chair or bed, as erect as possible. Get comfortable and close your eyes. Loosen any clothing that feels restrictive. • (If you are recording, start here.) Breathe deeply, in through your nose, and out through your mouth. In through your nose . . . out through your mouth. • Now, imagine your belly is soft. This will deepen the breath and improve the exchange of oxygen, even as it relaxes your muscles. Say to yourself in your mind “soft” as you breathe in and “belly” as you breathe out. Soft . . . breathing in . . . belly . . . breathing out. As you breathe in, imagine your belly puffing out. As you breathe out, imagine your belly flattening in. Soft . . . breathing in and your belly puffs out . . .”belly”. . . . breathing out and your belly flattens. • Sit quietly and practice “soft belly” breathing for five minutes. If you notice your mind wandering away, just come back to “soft . . .belly.” Over time and with practice, this will happen less and less. While learning the technique, you can put your hand on your belly to help you feel it expanding out and flattening in. The belly acts like a bellows, and when expanded out, it allows the diaphragm to drop down into the abdomen more fully, bringing oxygen to the base of the lungs. Do this exercise for five minutes two or three times a day—though not right after meals, or you may fall asleep. You can do it at bedtime if you are having trouble falling asleep, or right before the journaling exercise I shared with you in Tier 1. Choose a time when you won’t be preoccupied with how long you’ve been doing it or how long you have left. Soon you’ll find that in times of stress you can take a few deep breaths and say “Soft . . . belly” and relaxation will come. Good digestive health is key to a strong immune system that can fight off viruses and inflammation. 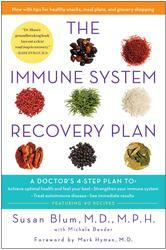 In The Immune System Recovery Plan, Dr. Susan Blum, one of the most sought-after experts in the field of functional medicine, shares the four-step program she used to treat her own serious autoimmune condition and help countless patients reverse their symptoms, heal their immune systems, and prevent future illness.